Subway is a popular sub sandwich chain that offers many low-calorie and low-fat sandwiches and salads. With a menu dedicated to meal choices that contain six grams of fat or less, Subway has several healthy options. The restaurant chain also offers several different sandwich and salad toppings that include fresh vegetables and low-calorie ingredients. 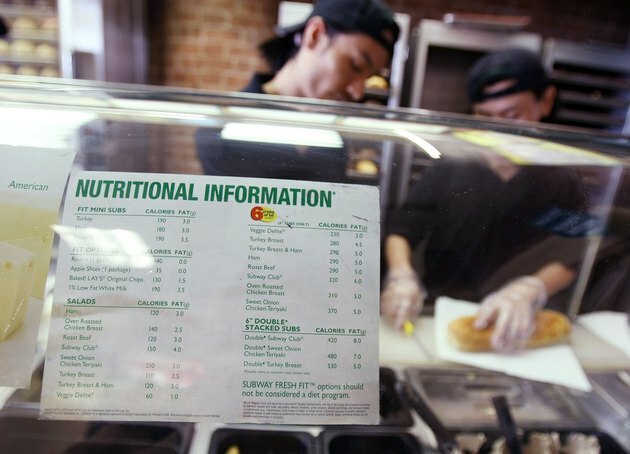 Browse the menu at Subway and take a look at their posted nutrition information to help guide you toward creating a healthy meal. Peruse the under six grams of fat menu. Look for a variety of salads and sandwiches that include your favorite deli meats and ingredients. Browse the soup menu for a variety of healthy choices. Consider the minestrone soup for only 90 calories or chicken noodle soup for only 100 calories and one gram of fat. Order your sandwich on 9-grain wheat bread or hearty Italian bread. Whole wheat and Italian breads have fewer calories and fat grams than other bread options on the menu. To watch calories and fat, order a six-inch sandwich instead of a foot long. Choose fresh vegetables as your sandwich or salad toppings rather than high-fat meats, such as bacon, and high fat condiments, such as mayonnaise. Select banana peppers, cucumbers, lettuce, tomato, green peppers and onions as healthy additions to your meal. Order American or Provolone cheese for the fewest number of calories and fat grams. Choose your sides wisely. Consider healthier alternatives to potato chips, such as apple slices, baked potato chips, low-fat yogurt or raisins, all of which Subway includes on their menu. The sandwiches and salads on the under six grams of fat menu will be the healthiest options. You can choose from ham, chicken, roast beef and turkey varieties. If none of these sound appetizing, order your meal from other menus with low-fat deli meats, such as ham or turkey. Consider Subway's flatbread sandwiches, wraps or mini sandwiches for alternate flavors that still include plenty of fresh ingredients without too many calories. Stay away from Italian meat sandwiches, such as salami, bologna and pepperoni, because they contain a lot of calories and up to 16 grams of fat per serving. Do not order the toasted subs that Subway offers because they can include unhealthy deli meats and high-fat toppings, such as ranch dressing or bacon. Pass on the dessert options that Subway offers because they are high in calories and fat. The sugar cookies have 220 calories and 12 grams of fat in each cookie. Do not fall into the trap that the healthy sandwich gives you a reason to eat a dessert, cautions Brian Wansink, author of "Mindless Eating: Why We Eat More Than We Think," because you can easily overeat simply by adding a cookie to the end of your meal. Is Subway a Healthy Fast Food?